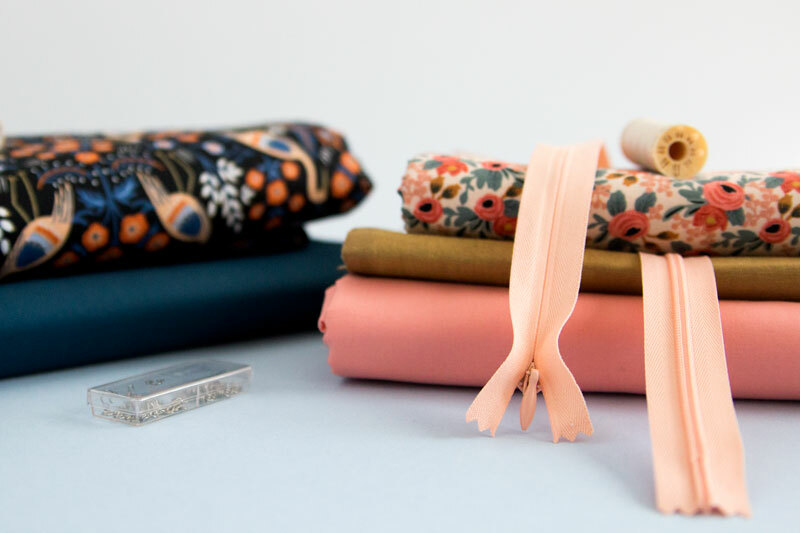 Let’s start with one of the best parts of any sewing project – putting together fabric and supplies. Main Fabric: For both versions, you’ll want a medium weight woven fabric such as seersucker, linen, quilting cotton, wool suiting, flannel, chambray, or double gauze. Lining: Both versions also call for lining fabric. Look for a lightweight fabric that will be comfortable against your skin and not show through your outer fabric. This can include lightweight polyester, cotton, acetate, silk, and rayon lining fabrics. Zipper: Both versions call for a 22″ invisible zipper. Hook & Eye: Look for size 2 or 3. Piping (optional): 1 1/2 yards piping, if you plan to add piping to your bodice seams. For versions 1 and 2, choose a medium weight woven fabric. It is important to find a fabric with a good balance between structured and light. Fabrics that are too heavy will lay stiff and awkwardly from the form, but fabrics that are too light may lack the needed structure for the bodice shaping. Medium weight is a broad term for all sorts of fabrics and Rue is designed to accommodate that spectrum. For instance, flannel will have a much different drape than a shirting. Both of these fabrics are a great choice for Rue and in the fitting post we will discuss tips for using differing weights of fabrics. Rue features some very distinct style lines on the bodice, keep this in mind when choosing fabrics. If your fabric’s design is really busy the style lines may get lost. If that’s what you’re going for, that’s great, but if not, you can opt for piping the style lines to bring more attention to them. Your lining choice will depend on which fabric you choose as an outer fabric. I always go for what I love and know, cotton voiles and lawns. Both of these substrates offer breathability and are soft on the skin. I’ve noticed that when I’ve lined dresses in synthetics, I get uncomfortable once I’ve been in the dress for a few hours, i.e. I get sweaty. If you do choose to use a synthetic, make sure it’s a nice quality. Counteracting your lining weight with your main fabric weight can sometimes be handy. For instance, if your main fabric is a flannel or wool, try lining with a silk in order to avoid adding unnecessary bulk to your Rue. One of my favorite things about a lined garment is finding the perfect pair of outer fabric and lining. Even if no one else will see my lining, I know it looks so good, inside and out! Rue has a very classic shape that can be worn in the office or out on date night. I like to think of an occasion that I’ll be wearing my garment to before I go fabric shopping. It reins me in a bit and keeps me from making duplicates in my wardrobe. Here are a few pairings of outer and lining fabrics that could make great Rues for different occasions. 1. Metallic Floral Brocade paired with Estate Blue China Silk from Mood Fabrics. 2. Manchester Metallic paired with Twist Cambric from M is for Make in the U.K.
1. Essex Yarn Dyed Linen paired with a Italian Floral Cotton Lawn, Blue from Hart’s Fabric. 2. Shetland Flannel paired with Cotton + Steel’s Hana Rayon from The Confident Stitch. 1. Pinstripe Chambray Linen with a Cotton Voile from Stonemountain and Daughter Fabrics. 2. Seven Island Citrus Multi paired with Cotton+Steel’s Solid Lawn from Fancy Tiger Crafts. 1. Kokka, Tsumiki Border from The Cloth Pocket in Austin, TX. 2. Red Stripe Seersucker from Fabric Depot in Portland, OR. 3. Merchant & Mills Augusta Classic Check Wool Flannel from Stitch 56 in Australia. 4. Cotton+Steel Banbana Grass from Fancy Tiger Crafts in Denver, CO.
5. Sevenberry Indigos Crosses from Backstitch in the UK. 6. ‘Komorebi – Sunshine Filtering through Foliage’ from The Drapery in Australia. 7. Cotton+Steel Space Thistles, double gauze, from Hawthorne Threads from Red Hook, NY. 1. Unicorn Poly Crepe from Stonemountain and Daughter Fabrics in Berkeley, CA. 2. Robert Kaufman London Calling, Lawn Flowers & Leaves Autumn from Fabric.com. 3. 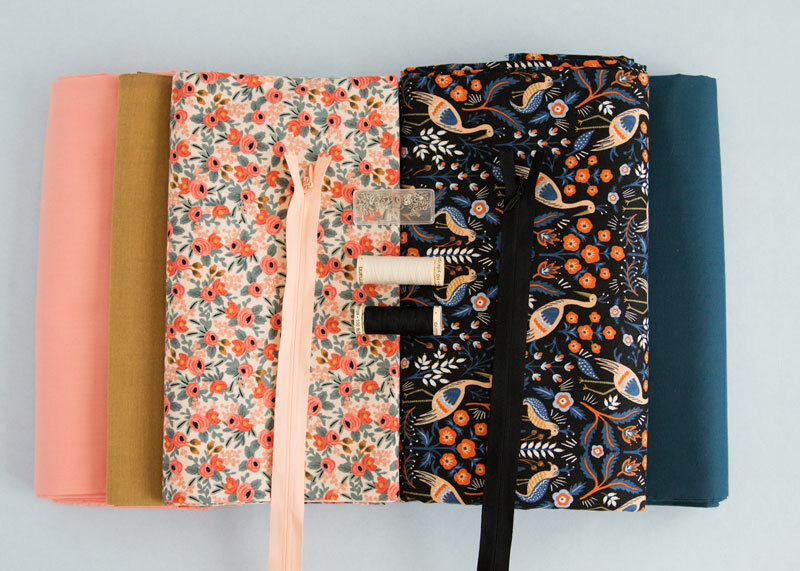 Charley Harper Nurture Feathers Organic Voile from Harts Fabrics in Santa Cruz, CA. 4. Cotton+Steel Playful, Pink Vintage Floral Lawn from The Workroom in Canada. 5. Bemberg Rayon Lining from Stonemountain and Daughter Fabrics in Berkeley, CA. 7. Rayon Voile from Harts Fabrics in Santa Cruz, CA. I will be making Version 1 of Rue with Tapestry Black from Cotton+Steel. This fabric is from their new Les Fleurs Collection by Rifle Paper Co. I’m pairing it with a Cotton+Steel solid lawn in Indigo. For Version 2, for my main fabric, I choose Rosa in Peach, also from the Les Fleurs Collection. I’m pairing it with a Cotton+Steel solid lawn in Peach. I will be cutting the Side Front Bodice in a contrasting fabric, Shot Cotton in Tobacco. My hope is to counteract the cutesy-ness of the floral print by mixing in this bold neutral. Shears: Use sewing shears (also called dressmaker’s shears) to cut your fabric. Even if you use a rotary cutter, it’s a good idea to have these on hand. Rotary cutter (optional): Not necessary, but makes cutting your fabric go faster. If you go this route, you’ll also need a mat. Pins: You’ll need plenty of pins. I prefer glass head ones because they won’t melt under your iron. Pattern weights: Use these to hold the pattern on your fabric while you trace it, or while cutting with a rotary cutter. Marking pens or chalk: Choose one that stays put and shows up easily on your fabric, but washes away cleanly. Machine Needles: Look for a size 80/12, this is the perfect size needle for medium weight fabrics. 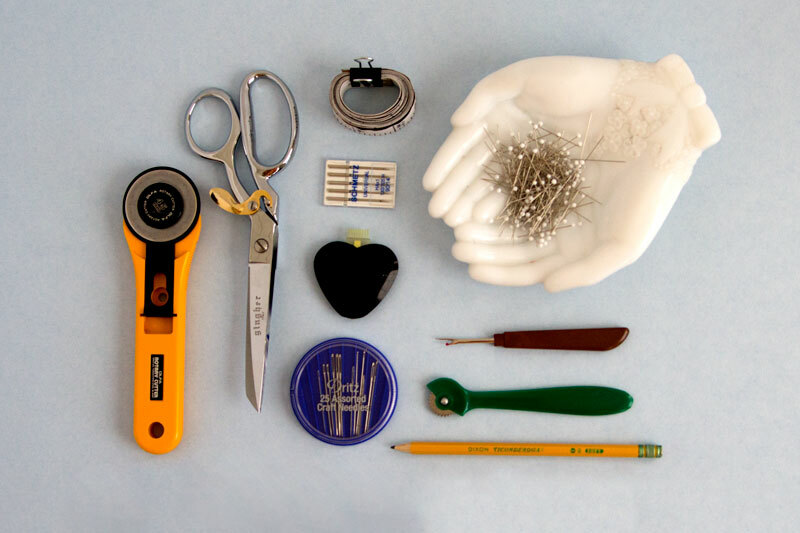 Hand sewing needle: For hand sewing the blind-stitching, hook/eye and creating the thread chain. Measuring Tape: For choosing the perfect size and altering your pattern for a perfect fit. Seam ripper: Because everyone makes mistakes. There are three presser feet that will be useful to have while making your Rue. The first is an invisible zipper foot. While it is possible to install an invisible zipper with a regular zipper foot, it is so much easier to do it with an invisible zipper foot. The bottom is grooved so that the teeth of the zipper unroll as you stitch, guiding the needle to sew precisely in the right place. Be sure to get the appropriate foot for your make and model of machine. Next, you’ll need a regular zipper foot for the zipper installation (middle) and the optional piping. These generally come as part of a machine’s accessories. You’ll also need a blind hem foot (right) if you wish to do a blind hem by machine. This is not absolutely necessary, as you can stitch a blind hem by hand or use a regular double fold hem, but it’s quick and fun to do it by machine and a blind hem provides an elegant, invisible finish for the bottom of your dress. 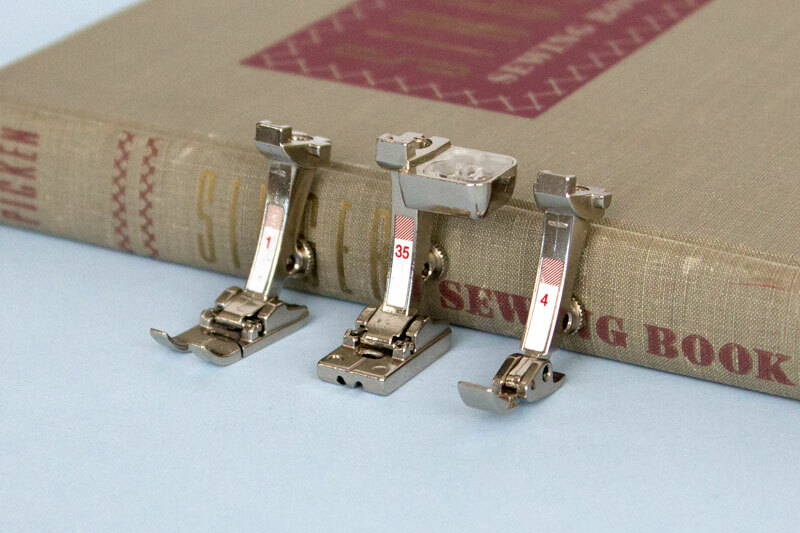 Blind hem feet are sometimes part of the accessories pack that comes with a machine, so consult your manual to see if you have one. Last but not least, you’ll need your standard, satin stitch presser foot for all of your straight stitching. Before cutting, pretreat your fabric however you plan on caring for the actual garment. This is not something you want to skip, because there’s nothing worse than your fabric shrinking after you’ve made something. If you’re using wool or silk, you can take it to the dry cleaner first. Most wools and silks can also be safely hand washed in tepid water with a delicate detergent. It’s always good to test wash a swatch first. On Thursday, we’ll begin discussing fit adjustments you can make to your pattern. If you have any questions about supplies, please comment below! I chose a quilting cotton with a geometric design–hexagons made up of triangle slices and each hexagon with a thin dark border. Looking at your suggestions above, I’m seeing more organic shapes, non-directional patterns… and at most stripes/checks for geometric designs. I guess I’ll find out how mine turns out! What do you think about cotton canvas? Do you think that’s too heavy? And I was thinking about making version 2 later in double knit. Do you think that would work? I have some that doesn’t have much of a stretch and it’s more like a woven with a bit of a stretch. Cotton canvas would be too heavy for the Rue. The structure of canvas would not allow the tucks and style lines in the bodice to lay properly. As for your double knit, you are more than welcome to try but it may not work out all that well. Even though it seems like they don’t have much stretch to them, the stretch and weight of a double knit will affect the design and how it drapes. Check out the From Woven to Knit article from Seamwork on ‘diagnosing’ if your woven pattern will work for a knit. Would a cotton shirting fabric have enough weight? Yes, especially if you lined your Rue with a heavier lining such as lawn. Sarai mentioned that she used interfacing for her silk dupioni version as its on the lighter end. Would you recommend it for double gauze as its on the lighter end of the spectrum? Surprisingly, double gauze has a good amount of weight. I would interface the side front bodice pieces to keep them from stretching but there is no need to interface all your pieces. Im debating doing a wool rue, but Im not sure where I could get good quality and maybe even a pattern to it. Do you know of any good online companies to look at?? I’m a real newbie and haven’t got the pattern yet but would like to buy my fabric today… How much should I get of each kind? Thanks! Hello Allison! I suggest holding off until tomorrow to read the “Choosing a size” post. Fabric amounts depend on the size you are sewing. Once you’ve determined a size, the chart on the back of the pattern will tell you how much fabric to purchase. So excited! I’m making my wedding dress and when Rue came out I knew I needed to use the pattern for it. I’m probably going to modify the skirt or draft my own, but I love the details in the bodice. I’m using a poly-satin for the outer fabric. Muslin, muslin, muslin! I’ve got your back and we can do this together! I am using a quilting cotton for my daughter’s Rue. She is a very warm (physically) person and dos not want the added weight of a lining. Will it be okay as far as shaping and draping to be unlined? Anything else I should be aware of or do? The shaping and draping will be affected by not majorly, especially if you making Rue in a quilting cotton. 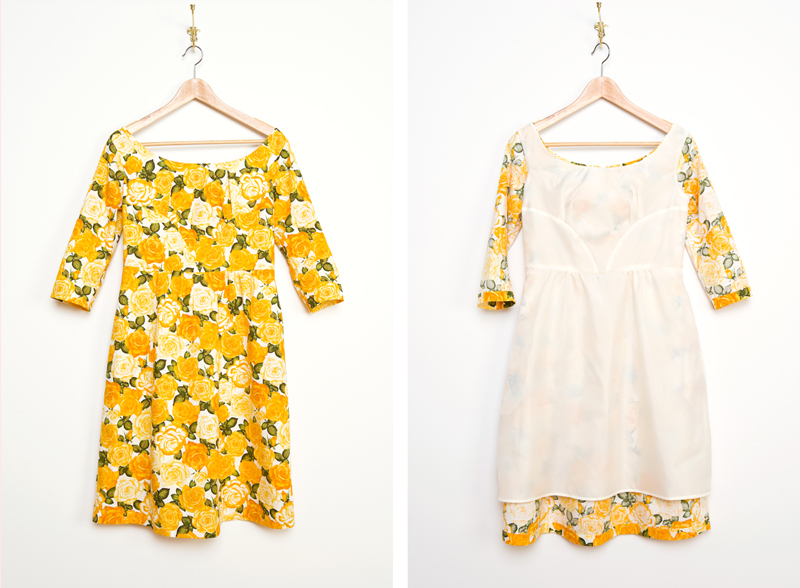 You can omit the lining and finish your neckline as desired, with a facing or bias binding. What are your thoughts on using a very small corduroy for either version? If what you mean by small corduroy is a lightweight one, that could work great. I would be careful when pleating, treat the lines in the pile as you would with stripes. Am I supposed to already have the pattern? If so, is is a free download or purchased download? Hey Phyllis! The digital version on Rue can be purchased here. Hi! Where is that beautiful yellow rose fabric from? Hey Kristin! The fabric is Henry Class Botanica III Royal Roses in Yellow, it can be purchased here, from Fabric Depot. Thank you for the tip on the Lyca. Drat! The pattern is perfect. I’ve purchased it (anyhow), for some day in the future where a bit of Lyca will work nicely. The URL is the same that I posted, so I won’t bother you with another try. IAC, I’m going with a double gauze from Stonemountain & D. In fact, I’m leaving right now for Berkeley. Oh my goodness, that would be so cute! I got a patterned quilting cotton and not sure of the lining but it felt lile it’d be comfortable. I also got piping to break up the print since it’s non-directional. I have my pattern on order but it hasn’t come. I also ordered Swedish Tracing paper to avoid cutting my pattern all up to get the right size. I have never lined anything, are there video tutorials to follow or will the sewalong directions be easy? I have a beautiful Liberty Tana Lawn that would look amazing as a Rue, but it sounds like it may not be weighty enough? Would interfacing some key bodice pieces help? You had me at Liberty! Lawn would work but I would definitely use a lightweight interfacing on the bodice pieces. Also, I recommend making a muslin and a mock-up in a not-so-fancy fabric first. I’m thinking of using a “lightweight” wool twill, the description calls it lightweight anyway. Its a bit heavier than Kaufman’s Shetland flannel. My worry is that it has a rather crisp hand. I want to do version 1 but it the fabric feels like its calling for a Version 2. Thoughts? You know what?! I have the feeling that Version 2 would work out better in that fabric as well. Have you pre-treated the fabric and seen if that effects the hand at all? Yes, Its currently line drying. Even in its currently damp state, it doesn’t have me hopeful for its use on this project damp its hand doesn’t feel like it will be great for the bust pleats. Now that its dry, it feels lovely, and quite reasonable for a version 2. Would a cotton lawn work for version 1 if I used a heavier weight lining? I have a piece of Kaufman cotton lawn that is just too beautiful to be lining. I live in Texas and the clothes made of breezy cottons are my go to. I’m planning to do the dress first in some quilting cotton I have on hand before exploring other fabrics. Thanks! The cotton lawn will be much lighter that the recommended fabric for Rue but you could make it work. Make sure to read the post about General Fit, where I explain sizing down for lighter fabrics. Other than sizing down, I would interface the Side Front Panels just to keep them structured enough to hold their shape. Thanks for the advice Katie! I think it will be a good idea to make a mockup in a cotton lawn with the modifications you suggest before cutting into this particular piece of fabric. Or maybe I’ll just use it in a nightie fashion as a commenter mentioned above. This pattern has so many great possibilitys for so many body types. Can you tell me how many pages there are to print out if one is using the wide format version? My Rue will be Version 1. (I’m trying to get an idea of costs to help me decide whether to buy the PDF or Paper pattern.) Thank you. I forgot to mention that the copy shop told me they would charge 75 cents per square foot. So maybe it’s not number of pages that I need to know, but square footage. I just want to say these comments and replies are so helpful. I’ve decided to make a rue skirt first with a large floral, a departure from my regular style, so I can pair it with a sweater for fall. Thanks.